HomeFor ClientsAnalyticsForex Analysis & ForecastsForex Technical analysis and forecastsForex Technical Analysis 2011/03/08. EUR/USD, USD/CAD, NZD/USD, EUR/JPY Forecast FX. Forex Technical Analysis 2011/03/08. EUR/USD, USD/CAD, NZD/USD, EUR/JPY Forecast FX. As it is seen from the eurusd analysis the EUR/USD currency pair has reached the target defined earlier. At the moment there is still some potential for the price to grow, however we should expect he pair to be corrected to the level of 1.3960 where we can try to buy it with the target of 1.4095. If the price leaves the rising channel, this case scenario will be cancelled. According to the usd cad analysis Canadian Dollar has broken the “triangle’s” lower border and we should expect the pair to continue falling into the area of 0.9505. 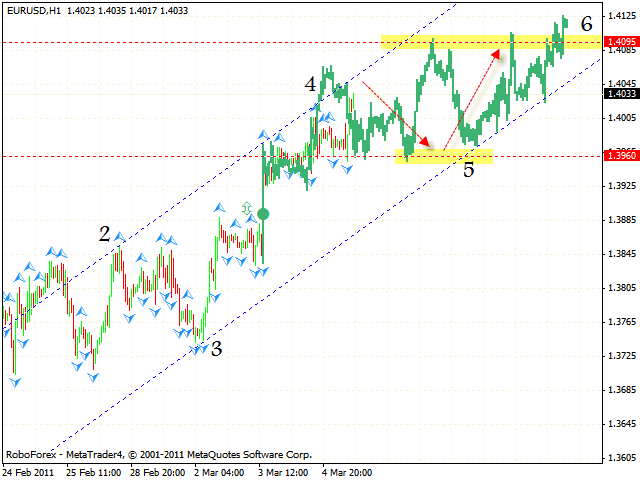 One can try to sell the pair with the tight stop above 0.9730. But if the price breaks the descending channel’s upper border, this case scenario will be cancelled and we will recommend you to close short positions. 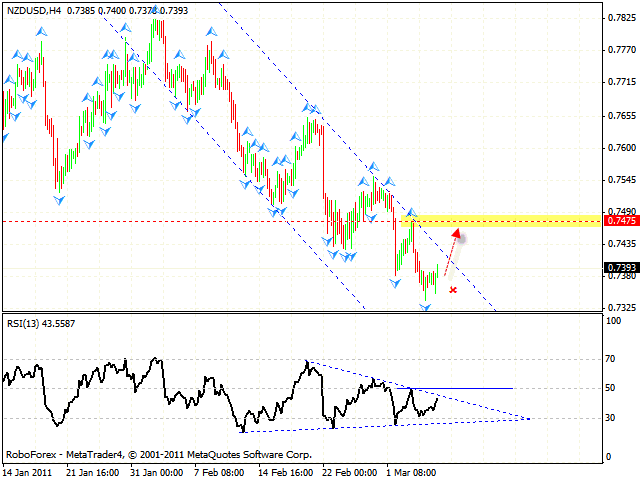 The movement of New Zealand Dollar is limited by the trend line at the RSI, which forms the “triangle” pattern. The online forex trading indicator hasn’t reached the pattern’s lower border, so we should expect it to be broken upwards with the following growth of the pair. The target of this growth is the level of 0.7475. 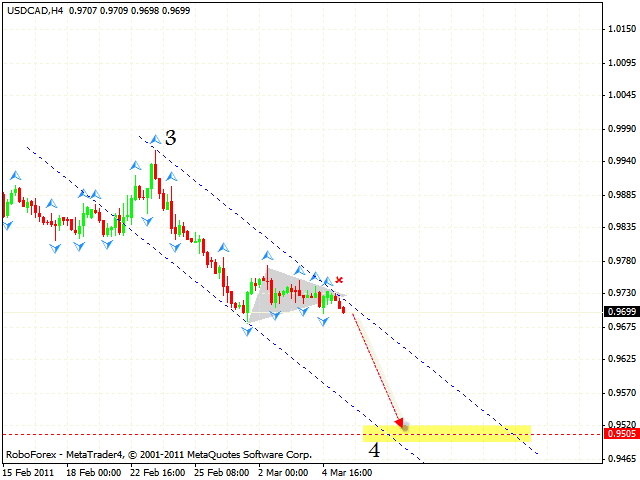 Judging by the nzdusd forecast you can try to buy the pair with the tight stop below 0.7350. 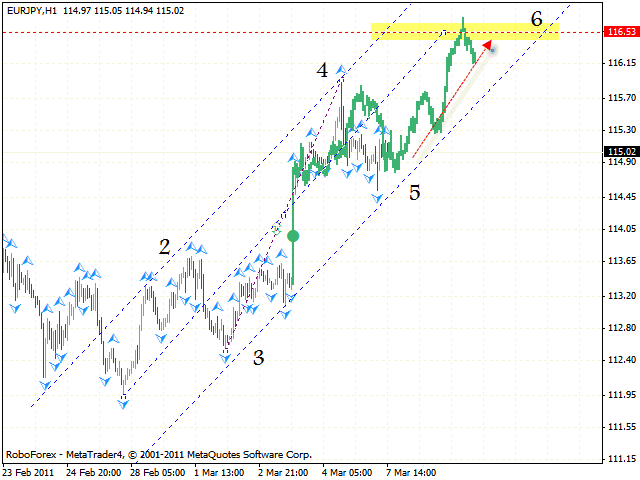 In case of the EUR/JPY currency pair we have rising pattern forming with the target in the area of 116.53. According to the eur jpy analysis one can either try to buy the pair with the tight stop below 114.90, or wait for the price to test the lower border and buy after the test. If the price breaks the channel, this case scenario will be cancelled.